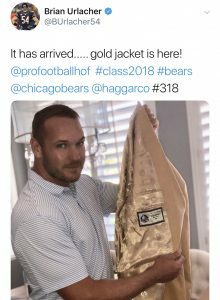 Brian Urlacher will step to the podium at the Pro Football Hall of Fame in Canton, Ohio next weekend and have an opportunity to put on an exclusive gold jacket, but at some point he will be talking about the blue in his life. Urlacher’s football beginnings were in the Land of Enchantment at Lovington High School. Speedy Faith spent 25 years at Lovington High School, including those in which Urlacher suited up for the Wildcats. Urlacher was born in the state of Washington, but his mother moved to Lovington following a divorce. He wasn’t always the giant presence in the middle of the field ready to administer bone-crushing hits. As a high school junior, he was only 6’1”. Speedy Faith remembers the first time he came across the future Chicago Bears linebacker. Little did they know they were watching a Hall of Famer in the making. Urlacher made an impact offensively, eventually becoming an All-State receiver for the Wildcats. “He was a huge weapon for us offensively,” Faith recalls. 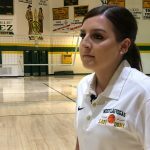 In a preview of things to come at the collegiate level, Speedy Faith decided to find ways to get the ball in the hands of their standout any way possible. Urlacher played both ways in high school. “Defensively, we played him in a strong safety position,” said Faith. “He had the speed for the secondary, but also strength of a linebacker. His senior year in 1995, Urlacher led the Wildcats to an undefeated season and state championship. He finished that year with 12 touchdown catches, six touchdown returns and two rushing scores. His signature moment coming in the state championship against Silver High School. As a senior, Urlacher wasn’t getting the kind of attention from colleges a future Hall of Famer would warrant. Texas Tech showed interest in the Lovington standout, but plans fell through. The University of New Mexico turned out to be Urlacher’s only scholarship offer. Tech’s loss was the Lobos’ gain. With the Lobos, Urlacher went on to lead the nation in tackles, earn All-America honors and eventually became the number one pick of the Chicago Bears in 2000 (9thplayer drafted overall). His first year in the league, Urlacher was named the NFL Rookie of the Year. He was named Defensive Player of the Year in 2005 and was selected to eight Pro Bowls. He played 13 years with the Bears, recording over 1300 tackles and 41.5 sacks, helping the Bears reach the Super Bowl and paving the way to the Hall of Fame. His high school coach will be there for the festivities in Canton. “As Brian was approaching the end of his career, we had conversations about the Hall of Fame. I brought it up. I said, ‘Brian when you’re inducted, I want you to keep me in mind for delivering your speech.’ I didn’t make the final cut, but that’s ok”. Urlacher’s former defensive coordinator with the Bears, Bob Babich, will introduce Brian. Saturday August 4, 2018. 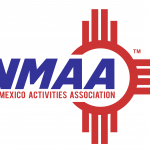 The day Lovington High School sends one of their own into the Pro Football Hall of Fame.